Cattleman states unidentified flying objects have been seen over his property. The story broadcast by some television stations regarding an alleged sighting of luminous objects over a cattle ranch caused alarm and curiosity in more than one resident of Guarayos. Some have traveled to this location at night to see if the luminous objects will reappear in the sky yet again. There are those who believe these are spaceships from another world, visiting the Earth; others say they are divine signs aimed a humanity. Disbelievers say these are mere fantasies and exaggerations. 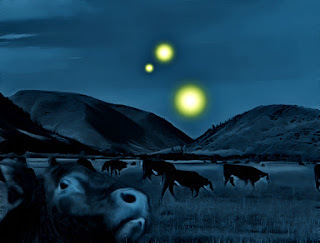 All started as a result of a statement made by cattleman Freddy Rodriguez, who indicated that luminous objects in the sky have been seen for some time now - sometimes very low to the ground, or high up, he says - over his ranch, Los Tres Cerritos, located 20 kilometers from Asención. Rodriguez - whose sighting was corroborated by several of his workers - said he saw one [object] at first, but their numbers increased over the course of the following nights, frightening the cattle. Argentina: A Big Footprint - The Ucumar Zupai?